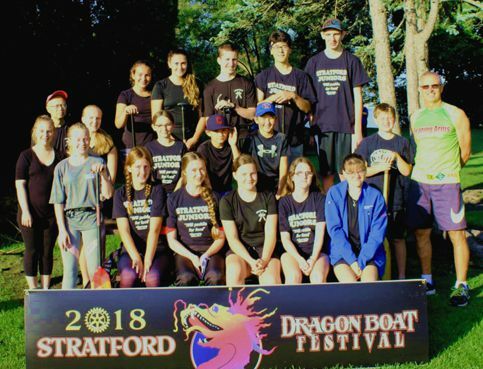 The Stratford Junior Dragon Boat Club are into their 18th season. The team competed at the 2006 Club Crew World Championships in Toronto in both Junior Mixed and Junior Women's divisions. As well the junior club has produced seven paddlers for Canadian National Teams that have raced at the World Championships. Competitive or non-competitive, the Junior Program welcomes all levels of participants from ages 11 to 18. Must be age 11 years by December 31, 2019. New for this year are the Spring and Summer Sessions. Includes 2 competitons: Wildwood near St. Marys on May 26, 2019 and London on June 9 2019. Includes racing at Stratford Dragon Boat Festival on September 14, 2019. Registration dates are Wednesday, February 13 and Tuesday, February 26 from 5 pm to 7:30 pm at Gene's Restaurant 81 Ontario Street. For more information contact Ken Gene at 519-271-9678 or kgene@rogers.com.